The Class Crustacea includes many aquatic organisms (such as lobsters, shrimp, crabs, and crayfish), but a few crustaceans are land-dwelling. Sowbug is a name often used for land-dwelling crustaceans in the order Isopoda. Also called "roly-polies" and "woodlice" (among other names), sowbugs have many body segments, 7 pairs of legs, and chewing mouthparts. Like many crustaceans, sowbugs have 2 pairs of antennae, but 1 pair is tiny and difficult to see without a microscope. Sowbugs resemble millipedes, but millipedes have 2 pairs of legs on each body segment and only 1 pair of antennae. Sowbugs breathe through plate-like gills located on the underside of the abdomen. Although the names "pillbug" and "sowbug" are often used interchangeably, the name "pillbug" is typically reserved for those isopods that can roll themselves into a ball for protection from predators. Many Kentucky isopods live in aquatic habitats. These aquatic isopod species are sometimes also called sowbugs and common ones look very similar to terrestrial sowbugs and pillbugs. SIZE: Body length up to about 1/2", but usually less than 1/4" for Kentucky sowbugs. Incomplete metamorphosis: young pillbugs and sowbugs hatch from eggs and look just like the adults, except smaller. They shed their skins as they grow. Some sowbugs care for their young in water-filled pouches on the underside of the body. Sowbugs are very common in moist, cool conditions, and are often found under rocks and logs. They feed on fungus and decaying plant material, usually moving and feeding at night. Sowbugs are preyed upon by many creatures, including spiders, centipedes, ground beetles, and small mammals. Some sowbugs have foul-smelling, foul-tasting defensive chemicals which provide some protection from predators. Pillbugs, of course, are also able to roll themselves into a ball for protection. Pillbugs and sowbugs are beneficial decomposers of leaf litter and other decaying organic material. They are sometimes considered pests when they enter buildings, but they cannot hurt people and do not contaminate food or damage possessions. For more information about pillbugs and sowbugs as pests, read our EntFact: Pillbugs and Sowbugs. Kentucky has several very common species of pillbugs and sowbugs. They are all similar in appearance and behavior. Pictured below is an adult Sowbug with an immature partially hidden underneath. As mentioned above, pillbugs are able to roll into a ball, while other sowbugs are not able to. 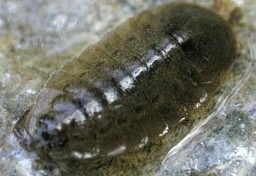 Aquatic Isopods, like the one pictured below, are very common under rocks and logs in Kentucky streams and lakes. Pillbugs and sowbugs are among the easiest arthropods to find and collect. Look under logs or rocks in almost any kind of environment. They are not easy to photograph, though: once uncovered, they almost never stop moving (except to roll into a ball in the case of pillbugs). They are best preserved in alcohol. Pillbugs can also make great pets! Read more about caring for them at Gordon's Woodlice Care Sheet. Although they resemble tiny millipedes, pillbugs and sowbugs are actually crustaceans, and are related to lobsters and crabs. In fact, terrestrial pillbugs and sowbugs are among the few kinds of crustaceans that are able to live on land. In other parts of the world, it is believed that eating pillbugs can help ease upset stomachs. Although not proven, this might be true because pillbug shells are high in calcium carbonate. Sowbug with Young photo courtesy Corel Photo CD, 1993.